My big mamma vat and her little test bucket. 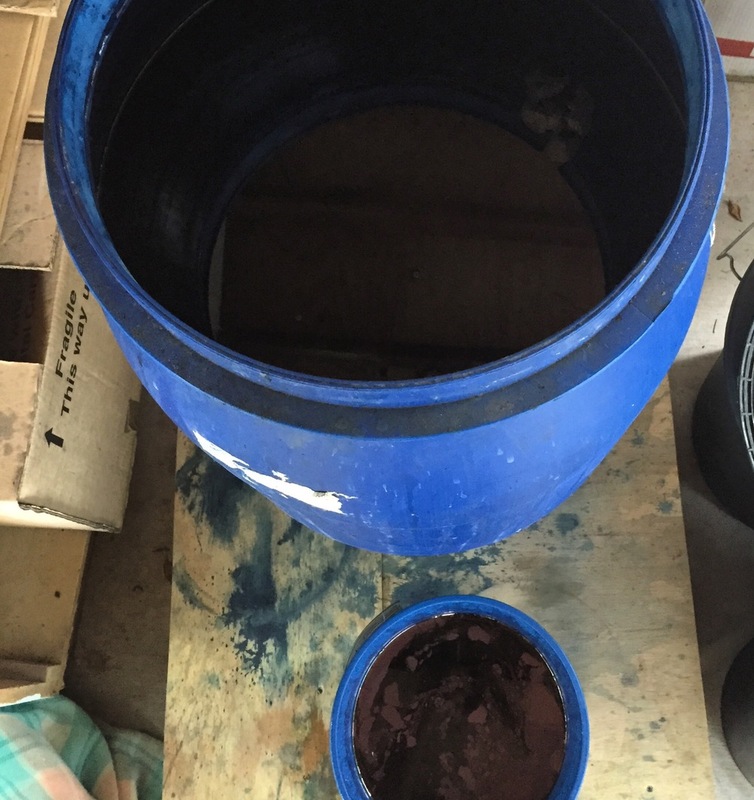 My original fructose vat lasted for a year and was the most wonderful learning experience for this infatuated indigo dyer but the day came recently when all my testing revealed that it was time to let her go. I needed a fresh young girl. Still it was sad to see my big mamma go. I pulled together the resources for a slightly smaller vat this time as I am going to take more time to dye smaller and more manageable pieces in this precious vat from now on. Using an organic indigo vat requires respect! and a whole lot of patience and time. Once you have the ingredients for the vat you need to warm the water to a scorching 80 degrees! It takes a fair bit of work to grind the indigo powder into a hydrated paste to add to the vat. Next comes the glucose and the lime. After a big stir it's 'put to bed ' until the next day. More testing and checking before the excitement of dyeing your beautiful fabric or threads. How lovely it is when your local environment shares your colour aesthetic. I was so lucky to take a trip to Morocco in August this year. I have a dear friend Colleen that lives in the seaside town of Essaouira on the Atlantic coast and I went to visit her. She takes groups of women on tours around Morocco a couple of times a year. They are sensational tours. She is an absolute pro and has been doing it for quite some time now. She agreed to meet me in Marrakesh when I arrived. Morocco has always been high on my list of places to see. Just the name conjures up such exotic images, colours and scents....sounds. My imagination goes crazy! All the beautiful paintings by famous french artists fuelled my desire to experience it for myself. I was not disappointed. I looked forward to hanging out with a dear and beautiful friend even more though. We had been neighbours in Melbourne and Colleen's ready laugh and sense of fun was something I missed. I was glad to see her new home. The first few days we spent in Marrakesh were just fabulous. Hot! Temperatures soared over 45 degrees each day and it was important to get out early and then to find a place to rest in the heat of the afternoon. 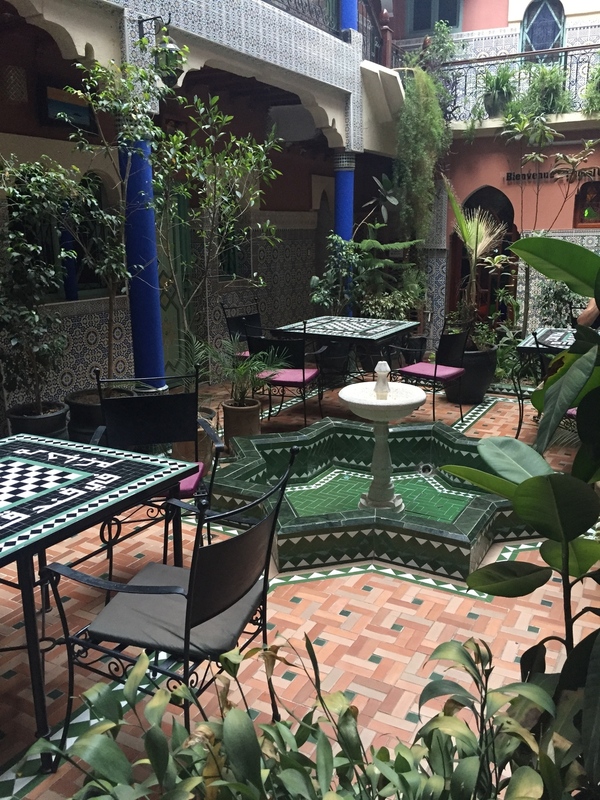 Luckily Colleen knew all the gorgeous places to go and we were well fuelled with delicious food and refreshed with mint tea and little pastries. There is so much to see in the tiny lanes and the noisy, busy souks of an old medina like Marrakesh. The people everywhere going about their business, women dressed in their beautiful djellaba and matching scarf and the darling children. Everything you could want or need is for sale. Herbs and spices, handmade shoes and carved wooden spoons. Oh the fabrics, weavings and the rugs. I hadn't really thought of buying rugs but they were so beautiful....I couldn't resist. The richness of the colour and patterns and texture of Moroccan rugs is just so fascinating. They tell the story of the place, the time and the maker in every fibre. And the stories they could tell about those that had used them...I can only imagine. I felt I was buying a textile treasure. Well I think I was. 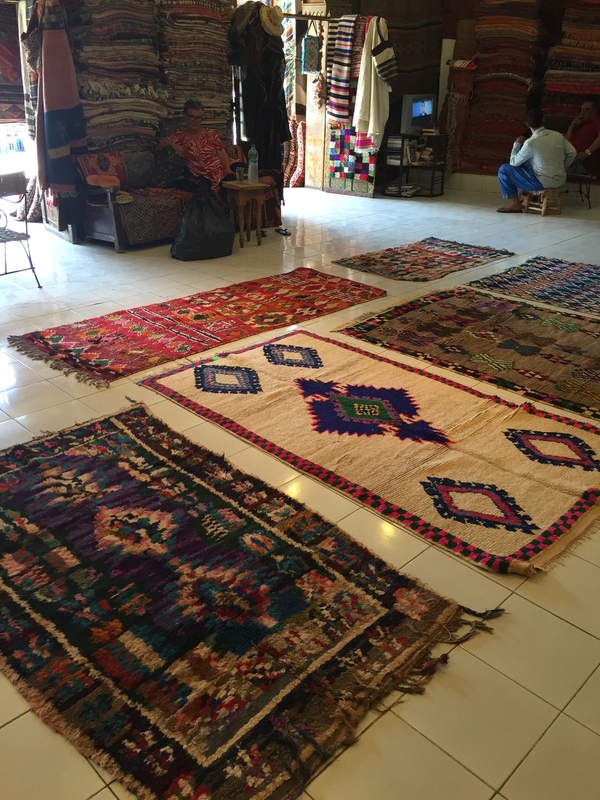 I especially loved the boucheroite rugs with their hand knotted strips of fabric...a bit like a rag rug. The colours and prints and patterns employed by the makers were just such a riot. I think they possess such joy. I was lucky to have my friend with me though. There is a game to be played when you buy anything in Morocco and I am not so good at bargaining or at knowing what a fair price is. But, you must sit and have tea. You must enjoy the 'floor show'. Carpet after carpet unfolded to reveal it's beauty. And then you must decide and then haggle. It's all part of the fun. Of course there was so much more to see and do but maybe that's for another post. I was on the hunt for blue, for indigo and for fabrics to dye. Oh no I nearly missed the anniversary of my blue love affair. Just over a year ago I first met indigo. Like a new love....I thought it was the most magical and gorgeous blue I had ever laid eyes on. I was infatuated. This time last year the whole town was on a high from the fabulousness that was the Byron Bay Surf Festival. This year the Byron Bay Surf Festival was cancelled (so sad...another story) and so October nearly slipped away without me stopping to pause and reflect. It was my involvement with that festival that got me inspired to explore the potential of indigo. I was making fabric surf board bags and was invited to do workshops at the festival. I decided to do tie dye with indigo and so began my research and practice for the event. Little did I know that it would become such a passion. I sewed for days to make the plain white board bags we would dye. I used various sturdy cotton fabrics with different textures. I love the different ways they take up the dye; patched together, side by side,dipped in blue. Oh divine! We sure drew a crowd at the festival as we untied and unbound our big fabric bags. They made a beautiful display and I fell more madly in love. So here on this new moon in Libra I am just going to honour the energy and fulfil a little hearts desire. If I could paint I would paint you a picture of what I see in my minds eye. I see me, sending a flare up into the night sky on a dark beach. But instead you get my hand made clay moon lady with her bad hair day fern head! So finally I am ready to make my little space in cyber world a reality. It's my time to shine.. ok maybe glow ..but not sparkle in little bursts and fizzes...I wish to gently reflect the light and the love that is so graciously bestowed me from this here incredible world. A little shop, a little blog and a little place to shyly tell the universe..."I am here". For some time I've been happy to fade into the background, the wallpaper, the shadows. I was a moon who had lost her sun. But here I am. And so are you. ha! It seems to have been the year of amazing astrological magic. I love to tune into what is being said about the lunar and planetary energies. Sometimes I use it to give myself a nudge, a little shift in perspective or a search for new answers. Last weekend was a super moon full moon and on the other side of the world there was a lunar eclipse. Wow. It seemed like the perfect time to reflect on what it was I really wanted and make some wishes. I'm not telling what they were....don't want to "moz" them! But it certainly is time to introduce my website to the world. I little crisis of confidence has had me waiting for the perfect moment and the perfect website. It's perfectly imperfect. Just like me. That used to be me. I was really sad. I felt adrift in a big blue ocean of grief that I thought would completely overwhelm me when my soulmate and love of my life passed away. Hey don't you be sad! Its ok. I am ok. It wasn't until I gave myself permission to really feel it and work through and process the huge life changes that had happened, that I started to deal with it. With the support of so many loved and loving friends and family I've come a long way. Being creative is what saves me......nurtures my soul.....fills my time.....is my meditation.....becomes my passion.....need I go on? Then I fell in love with blue. Indigo blue. 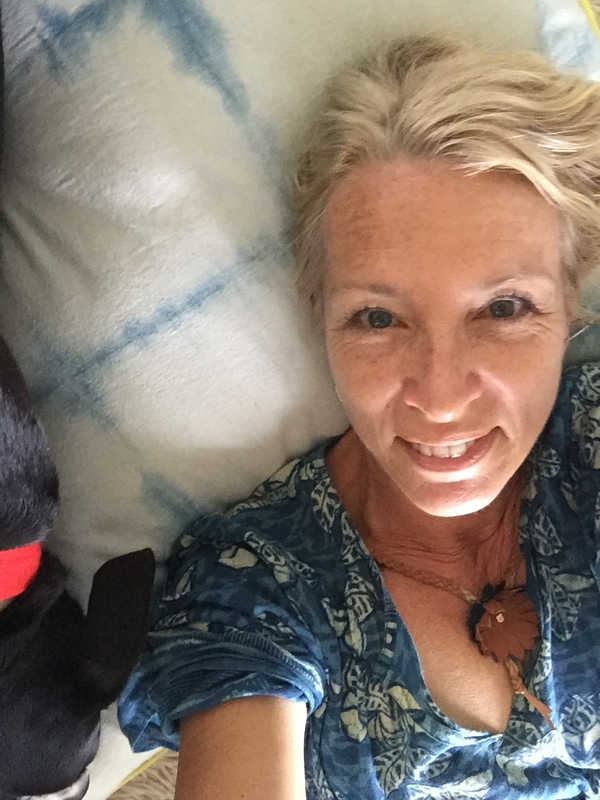 The story, the romance, the process, the magic....its earthy, human connection to diverse people and cultures and times past and present, yet all connected by the indigo blue. I had to know it and somehow master it! That is a life long task. I am merely a beginner.... but passionate and sincere. So, welcome. I've never done anything like this before. It's going to be fun.